In 1950, Switzerland had 80 per cent of the watch market, but by the late 70s, cheaper Japanese competition was hitting hard, with some of the big names facing liquidation. Then along came Swatch. Swatch came into being by merging two longstanding Swiss watchmakers. The new company’s brief was simple – make a high-tech, low-priced, but stylish analogue watch. Swatch had its worldwide launch on March 1st 1983, with 27 unisex models, designed initially as purely functional timepieces, but over time becoming more fashionable objects. Around 380 Swatches are now launched every year. 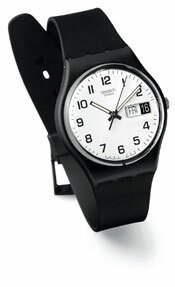 Swatch has never re-issued a watch, which has led to some watches becoming very collectable. Until now that is. The Once Again watch comes from the Originals collection (launched in 1983, before Swatch headed down the fashion route). It’s style is very much in its simplicity and as an Original Swatch, it’s certainly worth picking up, even as a reissue. And of course, as a Swatch, that isn’t going to cost a lot. You should be able to pick it up for around £25.